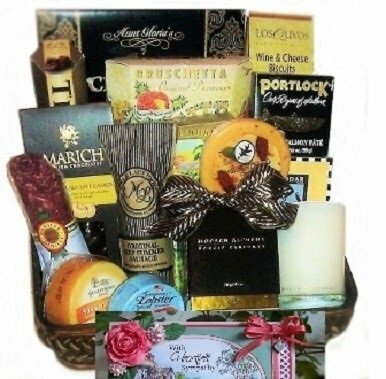 Elegant cheese and meat gift with boxed candle gift. An elegant gourmet gift includes a luxury boxed candle that adds a special touch when sending expressions of condolence. Includes Lobster Spread, Smoked Salmon Spread, Wrapped Salami, Beef Summer Sausage, Smoked Gouda Cheese, Gourmet Cheese Spread, Sesame Crackers, Smoked Almonds, Chocolate Covered Nuts, Flatbreads and Biscuits and more. Presented on a wooden tray.